When I was at Google HQ this past summer I was struck by a few parking signs that said: “Expecting Mothers.” For some reason, I read it as for being for people who were waiting to pick up their mothers. Maybe it’s because we have nothing of this sort in NYC (at least that I’ve seen). Should pregnant women and new parents be afforded the same parking privileges as those with disabilities? It’s an issue that is stirring up controversy in the Commonwealth. Earlier this week, House Speaker Greg Stumbo filed a bill that would allow pregnant women and parents with children under the age of one year the opportunity to utilize the same parking spaces as those with physical disabilities. The idea does not sit well with the Baker family of Paris. They have a son with cerebral palsy and they rely on handicapped parking spaces, especially since they need room to operate a wheelchair lift. They say it’s already difficult to find available parking spaces. Furthermore, they’re not convinced that all pregnant women and new moms are in need of such accommodations. Karen Baker says she does not have a problem with women who have been labeled as having high-risk pregnancies or those who have limited mobility gaining access to handicapped spaces. However, she does not feel that pregnancy is a true handicap. “The (parking spaces) were designed for people with disabilities and for the safe entry and exit of their vehicle,” she said. The Baker’s say they would be a little more open to the idea if more spots were created to accommodate new moms and moms-to-be. However, at this point, the bill does not include such a measure. Is it me, or is this more than just a bit silly? Before you accuse me of insensitivity, my wife is well into her pregnancy and routinely walking fairly good distances around the city (longer than your average schlep in the Trader Joe’s parking lot). Most parking lots have too much capacity to begin with, and so adding extra spaces that will likely sit empty much of the time (except maybe at Pea in the Pod or some such) for a marginal social benefit seems highly inefficient. Comments Off on Pregnancy Parking?. Click here to leave a comment. Comments Off on New DOT Boss Touts “Per Mile Pricing”. Click here to leave a comment. What’s the Real Risk of Older Drivers? Nothing brought the issue of older drivers into sharper focus than the 2003 crash at the Santa Monica Farmer’s Market, in which a 86-year-old man who had confused accelerator for brake killed nine people and injured scores more. As often happens in the media, something that had once basked outside of the light of attention suddenly became an “epidemic,” and untold numbers of stories warned us of the specter of the aging Baby Boom behind the wheel. This is, undoubtedly, a real issue, and the problems of the older driver do merit societal attention, but it is also likely that the circumstances of the Santa Monica event may have helped skew the actual risk posed: It was novel, it represented something out of our control, and, compared to most traffic fatalities at least, a large number of people were involved. It is a truism of road safety research that a kind of u-shaped curve exists, in which the riskiest drivers are found at both ends of the age spectrum, as shown in the chart below, which comes from a Rand study (more on that later). But this leaves out various, but important, parts of the risk equation, including: Which drivers (if any) bore a greater responsibility for the crash (an admittedly “noisy” bit of data), and the risk posed by certain classes of drivers to other drivers. In any case, Tefft, using data from the FARS database, as well as “exposure” data from the National Household Travel Survey (and he notes using two different sources is a limitation of the work), comes to some interesting conclusions. 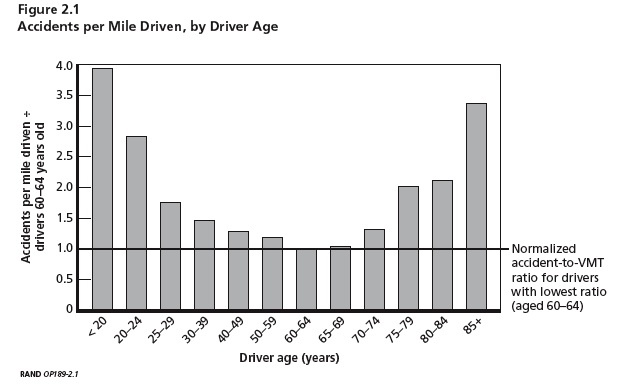 But, of course, most older drivers don’t drive as much as younger drivers, and they drive differently (i.e., they modulate risk based on their ability by choosing only certain roads, or certain times of day to drive, they may drive more slowly — insert Florida joke here — etc.). And so, while “a randomly-selected driver aged 85 or older is about 720% more likely than a randomly selected driver aged 30 to 39 to die in a crash, but only about 0.8% more likely to be responsible for a crash fatal to an occupant of another vehicle or a non-motorist, over the course of a year.” Per trip, the risk older drivers pose to others is “not statistically different” from drivers 30 to 39. There are good reasons to be concerned about older drivers, but the news stories suggesting the greatest threat to our safety might come at the wrinkled hands of aging drivers seems somewhat misplaced. In strict terms of cost and benefit, it would seem wiser (assuming older drivers continue to do less driving than their younger peers), rather than rolling out new “mandatory retesting” programs in state DMVs (granted, one must leave open the possibilities these already existing programs have impacted the older driver crash rate), to ratchet up GDL programs at the other end — it really is shocking that driver’s licenses, in states like North Dakota, can still be had at age 14. Or simply cracking down on the most risky drivers, regardless of age, rather than blithely allowing people with clear patterns of dangerous driving to inhabit the roads (and, by the way, please don’t start on the sob story, ‘but it’s the U.S., you can’t function without a car…’). Demonizing older drivers may also subtly suggest to younger drivers, in their 30s say, that they have much less to worry about, when as Teftt’s per trip numbers indicate, may not be the case. Comments Off on What’s the Real Risk of Older Drivers?. Click here to leave a comment.